We created MeVIDEO with one simple goal: to create the best compact, travel-friendly, user-friendly video tripod ever for today’s on-the-go filmmakers and videographers. "We created MeVIDEO with one simple goal: to create the best compact, travel-friendly, user-friendly video tripod ever for today’s on-the-go filmmakers and videographers. 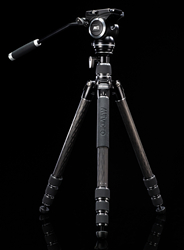 We wanted to create a tripod that makes sense from the moment you put your hands on it; something detailed, yet approachable - and then, to make it incredibly beautiful." - Brian Hynes, MeFOTO & MeVIDEO Brand Marketing Manager. Reverse folding legs to allow for a more compact folded form that makes it perfect for traveling. Split/center column allows for maximize flexibility as well as providing the ability to get very low to the ground.